AISB Grade 1 ~ Learning is Fun! In reading, students spent a lot of time working with partners learning different ways to read with a partner and sharing their thinking. So we both can see. In Math, students gathered data to make a bar graph of classmates' favorite colors. In Social Studies, students practiced using Kelso's Choices through role play.
. . . and in real situations. 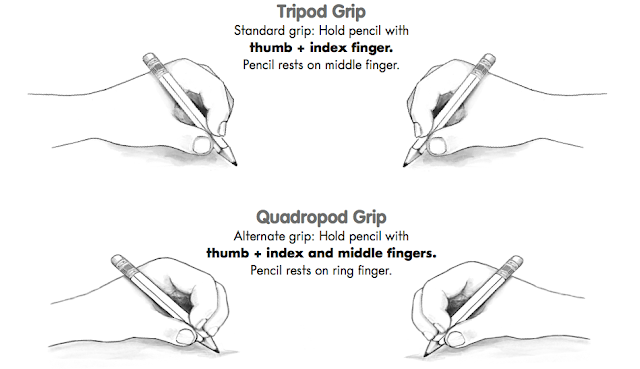 Pencil grip is only one component of handwriting. Most children naturally develop a pencil grip that is comfortable for them. Students practice proper letter formation always starting from the top, having good writing posture, and a good pencil grip (two or three finger pinch). Here are some images from Handwriting Without Tears to use as a resource when thinking about a good pencil grip and a little trick for how to get a good pencil grip. 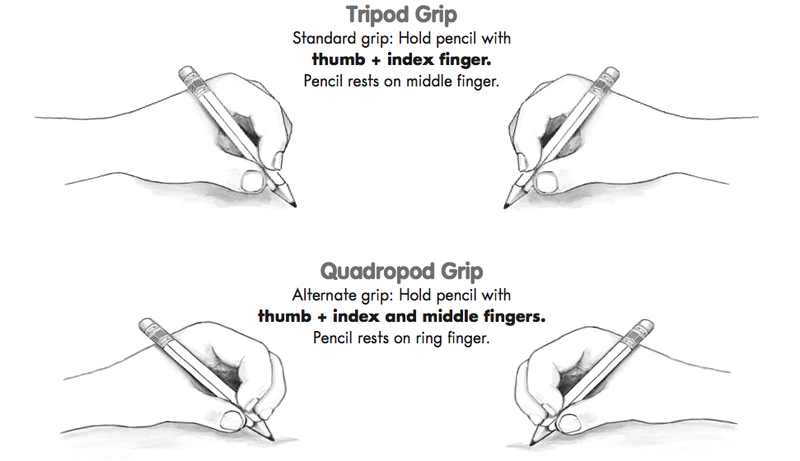 Watch for and remind your child about using a good pencil grip, posture and form. Literacy: We will study the letter sounds /g/, /o/, /u/, and /l/. Our sight words are he, she and be. We are continuing to build good reading habits. Making connections to self, other books, and the world is our focus next week. In writing, we will continue Showing with our pictures and Telling with our writing. Math: We will continue learning how to collect data and create bar graphs. Students will work with ones and tens and compare quantities using the words "greater than" and "less than" and "equal to." Social Studies: Students will continue to learn about respect in the classroom and following routines and procedures. Students will learn more about Kelso's Choices. We will also look at symbols on flags and we will create a class flag. and made a class book for each number from 1 to 16. In Social Studies, we read and learned more about communities and respecting others within a community. We had fun role playing different scenarios. Reading Buddies on Thursdays is always fun! Thank you for remembering to send your child's Take Home folder and books to school on Thursdays! Your child may or may not receive homework practice. Literacy: We will study the letters /g/, /o/, /u/, and /l/. Sight words are all, are, is and in. We are continuing to build good reading habits. We will focus on rereading books to learn more from our books, build reading stamina, and work with our reading partners. In writing, we will continue Showing with our pictures and Telling with our writing. Math: We will continue learning how to collect data and create bar graphs. Our new unit will introduce greater than and less than to students. Social Studies: Students will continue to learn about respect in the classroom and following routines and procedures. Students will also learn more about Kelso's Choices. News from Ms. Yaa: In the library last week, students spent time reading our new books, which arrived the week before. Ms. Yaa reports that some students from last year's Kindergarten class have outstanding library books. If you find that you have books at home that belong to our school library, please return them. At the end of our first grade school year, students will need to return our school library books or make arrangements to pay for lost library books in order to receive report cards. Through the year in first grade, Ms. Yaa and I will help to remind you and your child about any overdue books. Next week students will check out books to take home for home reading. Please note that Monday, September 24th is a professional development day and students will not come to school. Let's have a Great Week ahead! A big thank you to those of you who attended our Back to School night last week and our BBQ on Saturday! The power point and syllabus from Back to School night was sent you you via email if you'd like to review it. Take a look at our photos below where you'll see that buttons were a big part of our learning in math and literacy last week. We read button books, compared, sorted, and counted buttons in different ways, and built bar graphs from the number of buttons we were wearing to school. We found a dragon fly in our classroom and we enjoyed observing it through our classroom magnifying glass. Our second Star Student had a fun week! Word Focus: We will review the sounds /h/, /r/, /m/, and /d/. Our sight words are was, to and do. Reading: Students will learn to think about what kind of words they might see in the book before reading, learn to build stamina by focusing on reading for longer periods of time, refocus by going back and rereading to remember the last part they read, and learn more from books by rereading with a storyteller voice. We are retelling using the words beginning, middle, and end. Students will be reading independently in cozy reading spots this week. Writing: Students will write show and tell books about important places, make time for drawing AND writing, and learn to add longer labels to bring pages to life. Math: We will be finishing up our unit on counting and comparing. Students will review numbers and values from zero to ten, counting on; counting using a chart, and use the words more, fewer, equal, how many more, You can help your child be counting and comparing objects at home or even in the care when driving. Social Studies: Students will review good choices and bad choices, discuss manners, and be introduced to Kelso’s choices including the differences between a small problem and a big problem. is important to a learner’s development. Your child brought a green Take Home Folder on Friday. The front pocket is for home learning through the week. The back pocket is for things to keep at home. There are helpful tools inside the folder for your child along with a reading log. You and/or your child will tally each book read for the week. This also acts as a record of the number of books your child reads throughout the year. Please write any comments in the comment section and I will respond to you. The Take Home folder has a letter with information and some ways to support your child this year in first grade. The Take Home Folder remains at home all week and is returned to school on Thursdays, our short days, with home learning work, books and the plastic book bag. Students will bring it back home on Fridays with new books and possibly work for home learning. than the things we teach in school. school time. Where it seems that practice outside school will benefit the child, we assign it. learning will usually be individualized to meet the needs of your child. Elementary teachers encourage students and families to make reading a regular and enjoyable part of evening routines, including reading in the primary language of the family. Why is Mother Tongue So Important? We had a super week! Take a look at the photos below of our first Star Student, reading, working with letters in our names, creating self portraits to use as our portfolio covers, and sharing more All About Me bags. Back to School night is this week on Thursday! Come find out what your child will be learning in first grade this year. You'll also receive information about the important Take Home Folder coming home weekly beginning this week. To all my classmates, old and new. Each child will be Star of the Week during the first half of the school year. * Have a special chair to sit in at the carpet. * Be our CALENDAR person in class for the week. * Be FIRST to choose a job for the week. * Take care of our class mascot, Rasheed. Monday: Poster Presentation & Collection – Your child will share a poster (paper sent home) with the class. The poster may include photos of your child as a baby, recent photos, and photos of your family, pets, vacations, hobbies, events, etc. This is a fun way to share fascinating facts and favorites! This is a chance for your child to share something that he/she collects. If your child does not collect anything, your child may bring something that he/she is particularly proud of (send to school on Monday to be on display until Friday). Please remember to sign up for ASA here: http://bit.ly/ASA-Signup ASA begins this week. Every Tuesday is FREE ZONE TUESDAY where students can enjoy our school and friends until 16:00. Literacy: Students will be reviewing alphabet letters names and sounds. Next week, students will review the letters: /p/, /e/, /c/, /k/ and /n/. Our sight words are the, a, at and me. We will continue building good reading and writing habits. We will continue establishing and practicing rules and expectations for reading and writing, being independent learners in a partner setting as well as working with partners to become stronger readers and writers. This week, students will participate in Whole School Writing. The purpose of WSW is to create a snapshot of students’ writing throughout the school and using data collected to inform teaching and curriculum design. by Barbara Parks. Smelly Bus by Barbara Parks. Handwriting: Handwriting in first grade is where students solidify their handwriting grip. We are working on building stronger fine motor skills to help us with our grip and writing stamina. For that, students do a lot of cutting and pasting as well as working with clay or play dough, use tongs and other activities to help build fine motor skills. We are working on correct letter formation. "Top to bottom, left to right." You can help your child build stronger fine motor skills by using tongs at meal times, asking her/her to cut paper into confetti into a container, squeezing a soft ball with his/her fingers or palms , or other similar activities. Math: We will continue counting, reviewing the concept of a number, and reading and writing numerals. Our first unit focuses on Counting and Comparing. We are also learning how to collect data and make simple bar graphs. Social Studies/Science: Students will continue developing a stronger classroom community and learning how to be a good student and friend. We will spend more time this week thinking of our classroom expectations and rules. Monday, September 3 Q1 After School Activities (ASAs) begin. Sign up next week.